Cruise to the historic City of Bath , one of Britain's most appealing cities with Roman and Georgian architecture, including the famous Roman Baths, see the Royal Crescent and Jane Austen centre. The Vale of Pewsey – tranquil, spiritual and ancient. The Vale is a beautiful area in the eastern half of the county with the village of Pewsey at its centre. It is a walking and exploring landscape, studded with pretty and unspoilt villages and forms the western extent of the North Wessex. Devizes is a historic market town with a colourful Medieval past, wealth of history and architectural heritage with more than 500 listed buildings and a large Market Place in the heart of the town. Take a tour of Wadworth Brewery, sample their famous 6X and meet the Shire horses that still deliver to pubs in the town. See the 29 locks of the Caen Hill flight on the Kennet and Avon canal, a triumph of Georgian engineering. You are on the outskirts of the delightful town of Trowbridge, the county town of Wiltshire, it is one of the three largest towns in Wiltshire. The town's lengthy history is recorded in the museum, which tells the fascinating story of Trowbridge's people and past. The museum has also won the Association of Industrial Archaeologists award for 'best site visited' in 2008 & it is located in the last woollen mill in Trowbridge, which closed its doors as a mill in 1982. The fascinating collections in the Trowbridge Museum are accessed via The Shires Shopping Centre - built on the site of part of the woollen mill and home to a diverse selection of more than 50 shops all on one level and undercover. If you have all your provisions you can begin your journey. If not if you walk back along the towpath to Hilperton Road bridge 166, there is a convenient stores here. The River Avon rushes along beside the canal, Avoncliff is a nice place to stop with its tearoom and pub overlooking the river. One of the most impressive structures on Britain's waterways, the Avoncliff Aqueduct at over 100 metres long and 18 metres wide, carries the Kennet & Avon Canal over the River Avon. Bathampton & Bathwick are on the outskirts of Bath, turnaround just after the Cleveland House Tunnel, or if your boat is under 50 foot long, you can turn a bit further along after Sydney Wharf Bridge 188. Turn the boat and cruise back the way you came, past Hilperton marina again on your way to the Vale of Pewsey. As well as the many swing bridges around Seend there are 5 locks to navigate, luckily there are plentiful moorings at the ever-popular Seend Cleeve and close by pubs and quiet countryside to please the eye and fill the stomach. There is the Brewery Inn 200 yds south of Lock 19 and the Barge Inn by Lock 19. The Three magpies pub in Seend Cleeve has good quality food, nice beer garden and good ales- it is 200 yds south of Sells green bridge and a good place to moor for the night as it is 8.5 hours cruising to here. 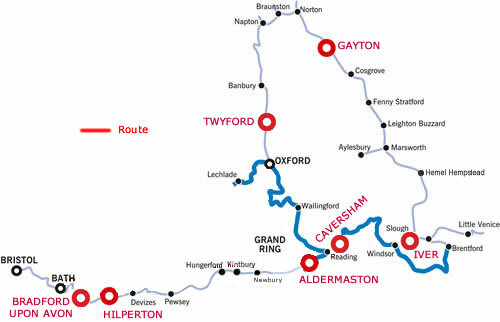 Today you conquer the fantastic Caen Hill flight of 29 locks in just 2.25 miles. At the top of the locks is a cafe if you are in need of refreshment after the climb up the hill through the locks. The views from the top are well worth the effort, with views over Salisbury Plain to the south and the Avon Valley to the west charting the route taken from Bath. 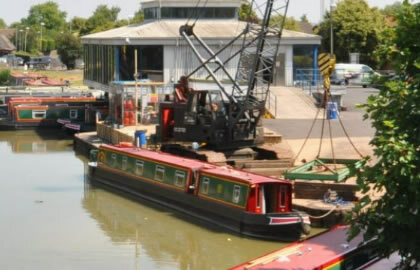 You soon reach Devizes & there are moorings by Devizes Wharf. Stock up on supplies here as there are no towns until you get to Pewsey & Hungerford. From Devizes Wharf you set off again, with not such an energetic day as yesterday, there are no locks, you cruise to the Vale of Pewsey and back to Devizes again. As you leave Devizes you cruise through rural surroundings, the village of Bishops Cannings is accessed from Bridge 133 with a pub in the village, and All Cannings from bridge 128 where there is a small shop & pub. More small villages are passed but there is hardly any habitation canalside as you pass through the Vale of Pewsey. A miniature suspension bridge carries a private footpath from Stowell Park across the canal, as is the only surviving example of its kind. Stowell park House was built in the early 19 century, and can be clearly seen from the canal. The Barge Inn is canalside in Honeystreet before bridge 124. Beyond the village to the north can be seen the white horse cut into the hill in 1812. At Wilcot bridge 117 you can get to the small village of Wilcot where the Golden Swan Pub stands beyond the green at the far end of the village. A one handed ghost is said to haunt this pub. Pewsey Wharf is a mile from the town centre but has a pub canalside. There are shops in the town which can be accessed to the north of Bridge 114. To the north, hills descend to the waters edge and to the south the land opens out, giving fine views over the Vale of Pewsey.